Activity-Based Computing  aims to capture the state of the user and its environment by exploiting heterogeneous sensors in order to provide adaptation to exogenous computing resources. When these sensors are attached to the subject’s body, they permit continuous monitoring of numerous physiological signals. This has appealing use in healthcare applications, e.g. the exploitation of Ambient Intelligence (AmI) in daily activity monitoring for elderly people. In this paper, we present a system for human physical Activity Recognition (AR) using smartphone inertial sensors. As these mobile phones are limited in terms of energy and computing power, we propose a novel hardware-friendly approach for multiclass classification. This method adapts the standard Support Vector Machine (SVM) and exploits fixed-point arithmetic. In addition to the clear computational advantages of fixed-point arithmetic, it is easy to show the regularization effect of the number of bits and then the connections with the Statistical Learning Theory. A comparison with the traditional SVM shows a significant improvement in terms of computational costs while maintaining similar accuracy, which can contribute to develop more sustainable systems for AmI. Anguita, D. [et al.]. 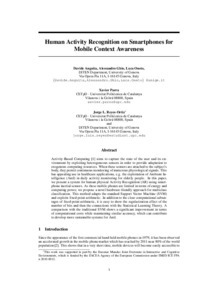 Human activity recognition on smartphones for mobile context awareness. A: Neural Information Processing Systems Conference. "Advances in Neural Information Processing Systems 26: proceedings of the 2012 conference". Lake Tahoe, Nevada: 2012, p. 1-9.